If you consider yourself rather handy around the house, you’ll likely be looking for ways to construct simple metallic frames for use in a wide variety of projects. EZTube offers stainless steel tubing that is free of bolts and thus easy to use. The simplicity of the design means that homeowners and business owners can create promotional displays, lighting rigs and other devices without an enormous degree of mechanical skill. The system is also reasonably priced, which means it will prove eminently useful to nearly all people. Small business owners may find the stainless steel tubing to be especially beneficial. If you have been charged with setting up portable displays for a trade show, you’ll want to choose a design that is as lightweight as possible. This will allow you to create elegant displays that can be set up and disassembled in just a few minutes. This particular design also allows you to use virtually every possible right angle, which means that recessed shelving panels and other unique blueprints will be easy to handle. Stainless steel is a rigorously durable material that will hold up well under stress. In fact, you can expect to use the same tubing for several years. Whether you wish to build animal enclosures, lighting displays or custom photographic booths, you can count on the tubing for complete and utter durability. Invite EZ Tube into your Band! One of our favorite creations is this trade show display that is the backdrop for a band. We really like this display because it is simple yet incredibly effective. The use of lighting is amazing and the mobility of the display made set up and take down a breeze. When you’re working with intricate lighting, the last thing you want to do is spend the majority of your efforts getting the displays up. The use of our boltless construction system creates a 3-D effect that cannot be simulated on a flat screen. This is one of the many reasons why EZ Tube should be used in more than just trade show displays. Don’t get us wrong, we love when we get pictures of our boltless construction system being used in trade show displays, but unconventional usage of our system really piques our interest. Take this display for instance; something similar to this can be used by more than just a company at a trade show. Bands – want to get noticed on stage? Want more than just a bed sheet with your logo hanging up behind your drummer? Create a stage display that will grab the crowd attention and add another dimension to your live show. This is an inexpensive way to improve the production of your set quickly and easily. Get creative with the EZ tube boltless construction system and make your next set the most visually stunning one you’ve ever had. Want to share an EZ Tube creation? Send us your pictures; we’d love to see them! Modular Framing Makes Displays Traveling a Snap! Not all trade shows are the same. If you are going from city to city; convention hall to convention hall – you know that every plot of hotel carpeting you take up is different. Unless you work for a major international conglomerate, your square footage and placement is going to be different every time. 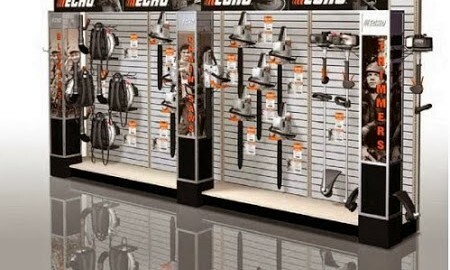 This can cause problems when it comes to constructing your display. What’s great about EZ Tube is that it is mobile, manageable and modular. Whatever kind of placement you get at your next trade show or convention, you know you can be prepared with EZ Tube modular framing. Think about it; whether you are placed in the center of the convention hall or against the wall, there are several design challenges that go into creating a great display for your situation. With modular framing from EZ Tube, you don’t need to travel with bulky additions, curtains, or anything else that takes a long time to modify your display. EZ Tube makes custom displays easy! When you make your display with EZ Tube, your display becomes versatile in the sense that you can change, replace, add or subtract from your display in seconds. The parts are so compact that travelling from town to town with them is far easier than with pre-assembled structures that are big and bulky. If you are making several stops on your trade show tour, use the modular framing that you can trust – EZ Tube. When we say that you can create anything with EZ Tube, we mean that you can create ANYTHING with EZ Tube. Think about it, whether you need an apparatus to hold signage or a mobile lighting rig, EZ Tube is the most versatile boltless construction system available anywhere. From the trade show to the home, EZ Tube is an excellent building material for anything that needs a frame. Our customers are possibly some of the most creative people on the planet. We have been stunned by some of the projects that they have come up with over the years. We had also assumed that our product would be used for obvious, practical means such as trade show displays, art displays, etc. But we have seen nothing but brilliant examples of just how great EZ Tube is for any project. From fish tanks to vending machines, our customers have shown us that anything is possible with EZ Tube. The only limitation is your imagination with our boltless construction system. You know that the best results come through trial and error, and with EZ Tube, it has never been easier to recover from a mistake when creating a piece. Use the wrong tube or connector? No problem! Because of the way our boltless construction system works, disassembly is quick and painless. How often do you find yourself working on a project and think, “I could just save a bunch of time and buy this thing.” Then you find out that this large piece of hardware is well out of your price range? Let’s take one of our favorite EZ Tube projects for instance. These ingenious customers created an exotic bird cage with the help of our revolutionary boltless aluminum tubing. After doing a quick search, we have found exotic bird cages similar to this are going for upwards of $2500! These fine folks who created this cage saved hundreds of dollars in exchange for a little work. But let’s say they took another route; they wanted to build their own cage but they didn’t use the EZ Tube aluminum tubing system. Not only would they have paid more for the actual tubing, but they would have spent much more time on creating the cage because they would have had to bolt the tubing themselves. Not only would they be buying additional hardware, but, since there are more parts, there is more room for error. They decided to use the EZ Tube aluminum tubing. What can you create with EZ Tube? Check out our photo gallery and see how others have gotten creative and saved money with the power of EZ Tube! Purchasing a custom portable lighting rig can cost an arm and a leg. Why overspend when you can create a truly custom lighting rig with EZTube? With our boltless construction system, you can create a right that is made for the lighting you already have. This gives you the freedom to work within the parameters of the venue or home you are working with. This eliminates expensive custom rigs or having to use an inconvenient house rig. By making your own lighting rig using our boltless construction system, you avoid issues that may arise when you are using a flimsy, clumsy system that you see all too often by armatures. Let’s take a look at some of the creations our customers have made. boltless construction system, you are in complete control over your rig. Above is a different style of light rack, using the same principal. As you can see, our boltless construction system is extremely versatile when it comes to making your own creations. Whether you are making a fixture for your home or taking your rig on the road, check out what EZTube has to offer. As you know, EZTube offers the best in stainless steel tubing that makes creating displays a whole lot easier. Now, you can take your trade show display on the road without needing a moving van to carry it around. You know you need to make an impression at the next trade show, but you don’t want to be stuck with feather banners like everyone else, you want your display to POP. With stainless steel tubing from EZTube, you can create virtually any style of display you want and break free from the crowds at trade shows. With a push button snap lock system, you can create a multi-dimensional display that will blow your competition out of the water. Simple using EZTube stainless steel tubing to build a sturdy, easy to make and easy to dismantle display for your next trade show and wait and see people flock to your booth. Another advantage to EZTube is the amount of weight it can hold compared to other display styles. Take a look at this ECHO display, made with EZTube stainless steel tubing. As you can see, there are chainsaws, weed whackers and leaf blowers on this display. The most difficult part about assembling this display was probably where to hang the merchandise, not the assembly. Get out of the habit of getting large, heavy, bulky displays and upgrade to EZTube stainless steel tubing and create your next tradeshow masterpiece for a price that you can afford today!